Figure 1A: Western blot was performed using the Diagenode antibody against hASH2 (cat# CS-026-100) diluted 1:1,000 in TBS-Tween containing 5% skimmed milk on nuclear extracts from HeLa cells (upper panel: lane 1) and ectopically expressed FLAG-tagged ASH2 (ASH2-F, upper panel: lane 2). The lower panel shows the same western blot with an anti-FLAG antibody. The molecular weight marker is shown on the left. 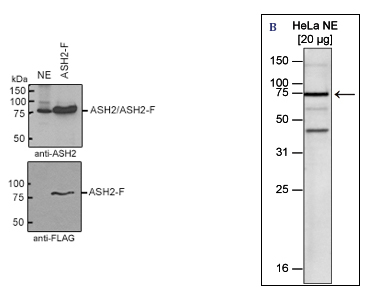 Figure 1B: Western blot was performed using nuclear extracts from HeLa cells (HeLa NE, 20 μg) with the Diagenode antibody against ASH2 (cat# CS-026-100) diluted 1:1,000 in TBS-Tween containing 5% skimmed milk. The molecular weight marker (in kDa) is shown on the left; the location of the protein of interest is indicated on the right. Diagenode strongly recommends using this:	ASH2 polyclonal antibody - Pioneer (Diagenode Cat# C15310026 Lot# 001). Click here to copy to clipboard.